Doom and company are stationed on Phobos when all hell breaks loose. 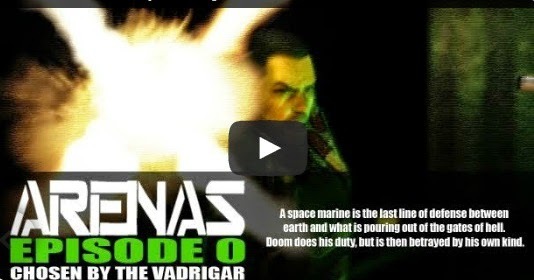 Here´s the remake of the Episode 0 "Chosen by the Vadrigar" by Tritin films. It is 10 minutes long and very impressive. The primal version of this short movie starts in time 6:50. So enjoy the first new 7 minutes! It´s the gold for the people, who have played the game Doom1. In this version, Doom is guarding the base on the Mars´s moon called Phobos. The backround is the mixture between Doom and Quake but you can easily regognize the places from the first level of Doom1. The sounds are from the game Doom1 too. Toto je předělaná epizoda 0 "Vybrán Vadrigarem" od Tritin films. Trvá deset minut a je velice zajímavá. Primární verze epizody 0 začiná v čase 6:50, takže is užijte nových 7 minut! Tuto epuizodu ocení především lidé, kteří hráli hru Doom 1. V tomto videu střeží Doom základnu na Marsu zvanou Phobos. Pozadí a prostředí videa je smíchaninou her Doom a Quake ale velice lehce poznáte prostředí prvního kola Doomu 1. Stejně tak zvuky jsou použity z této jhry.